As a Cox Category 1 chamber we can take any patient in any diagnostic condition – from mild symptoms through to ventilatory support for the critically ill including full patient monitoring. DCI aka ‘the bends’ symptoms can include : pain in joints and altered sensation, skin rashes, balance and coordination causing difficulty in walking and standing, headache, nausea and vomiting, vertigo, numbness and tingling in extremeties, unusual fatigue, paralysis, muscular weakness, difficulty urinating, difficulty breathing and altered levels of consciousness. The above list is not exhaustive of all signs and symptoms of Decompression Illness but outlines some of the most common forms of DCI. 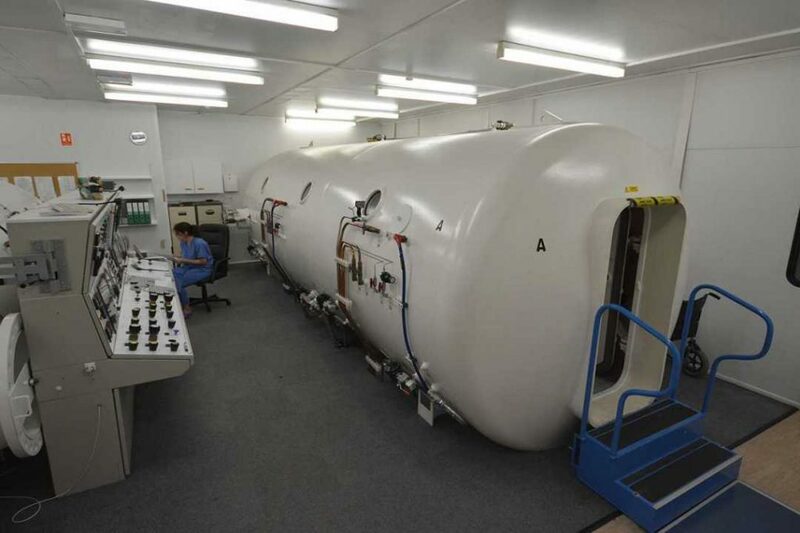 Patients suffering from mild DCI should still contact a Hyperbaric Facility for help and advice. 24 hour Help and Advice Line : 0151 648 8000. In the event of a diving accident please contact the Hyperbaric Facility as soon as possible. Drink plenty of fluids and preferably an isotonic solution. Go on oxygen. Do not attempt to drive yourself to the Facility. Think about bringing an overnight bag in case you are kept in hospital overnight and if possible bring your dive computer with you.